Spotted at the St. Lawrence Sunday Antique Market this past Sunday, an old HBC point blanket. Using Harold Tichenor's book The Collector's Guide to Point Blankets, as a reference, the label was used "for a brief period around 1930." The blanket was in very good condition but by the end of the day still remained unsold at an asking price of $95.00. 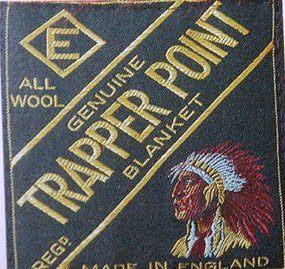 I was selling a 1920s Trapper Point blanket from Eaton's that I had bought at the market that morning. It sold.